Why do I need to take control over the back button behavior? The back button is available on Windows, Android and under certain conditions on iOS. It is one of the key navigation hooks. While the implementations vary between platforms, the functionality is always the same – go back one step in navigation. Sometimes, we need to execute actions before going back, like notifying other parts of our application or even blocking back navigation because we need to perform actions on the local page (think of a WebViewthat has internal navigation capabilities for example). While we do need only a few lines to intercept the hardware back button on Android and UWP, the software back buttons on Android and iOS need some additional code. And that’s it, if you just want to get informed or handle back navigation on your own. However, from some of the projects I have worked on, I know that I may need to prevent back navigation. So let’s extend our code to reach that goal as well. And that’s it. We already implemented everything we need in our Xamarin.Forms project. As often, we need to write some platform specific code to make our Xamarin.Forms code work in all scenarios. As the Universal Windows Platforms handles the back button globally, no matter if you’re on a PC, tablet or a phone, there’s no need for additional code. Really. It’s already done with the Xamarin.Forms implementation. The first step is to override the OnPostCreate method. Within the override, we are just setting the toolbar to be the SupportActionBar. If we would not do so, the more important override OnOptionsItemSelected would never get triggered. The back button in the toolbar has the internal resource name ‘Home’ (with a value of 16908332). If this button is hit, I am triggering the hardware back button press handler, which will get code execution routed back into the Xamarin.Formscode. By returning true we are telling Android we have handled this on our own. And that’s all we have to do in the Android project. Let me explain the snippet. On iOS, we do not have direct access to the back button events in the navigation bar. We are able to override the back button, though. The first thing we have to make sure is that there is a UINavigationControlleraround. This way, we are still able to use our base page class implementation and its features for modal pages. The next step is to create a button with an image (which needs to be bundled). Of course, we want the button’s text to behave exactly like the OS one does. That’s why we are going to get the parent view. We can easily use the current view’s NavigationStackindex for that – as long as we do not have cross navigation but a continuous one. In this case, the page before the current page is our parent. If the parent’s Titleproperty is empty, we are setting the title to “Back”, pretty much the same like the OS itself does. If you want it to be empty, just add a Title to the page with ” ” as content. This works also if you do not want your MasterPagein a Xamarin.Forms.MasterDetailPage to have a visible title, btw. The most important thing to note is the button’s TouchDownevent – which is why we are doing this whole thing. First, we manually navigate back in iOS via the PopViewControllermethod (if necessary). After that, we are once again invoking our Xamarin.Formsimplementation via the SendBackButtonPressed method of the Xamarin.Formspage, which will then trigger our EventToCommandBehavior we implemented earlier. The last step is to create an UIViewcontainer for the button and assign it as a UIBarButtonItemto the UINavigationController via the SetLeftBarButtonItemmethod the UINavigationItem provides. And that’s it, we now also have control over the back button on iOS. I do not have an implementation for handling that in a better way, but I will update the sample with another post in this series later on. At least I have full control over the back navigation, which is (for the moment) all I need. As always, I hope this post will be helpful for some of you. I also updated the source code of my XfMvvmLight sample on Github to match this blog post. If you have feedback or questions, sound off below in the comments or via my social channels. Often, we want to/need to know when views throw certain events. However, due to using the MVVM pattern, our application logic is separated from the view. There are several ways to get those events into our ViewModel while keeping it separated from the views. One of those is using an interface, which I showed you already in my blog post about navigation in Xamarin.Forms with MVVMLight. Another way is the good old EventToCommand approach. Some of you might have used this approach already in WPF and other .NET applications. Xamarin.Forms has them too, this post will show you how to implement it. In Windows applications like WPF or UWP, we normally use the Interactivity namespace to use behaviors. Xamarin.Forms however has its own implementation, so we need to use the Behavior and Behavior<T> classes. All controls that derive from View are providing this BindableProperty, so we can use Behaviors in a lot of scenarios. Until the new XAML Standard is finally defined, we have to deal with this. Xamarin provides a nearly ready-to-use EventToCommandBehavior implementation and an quite detailed explanation (which is why I won’t go into details on that). The implementation has two part – the BehaviorBase<T>implementation and the EventToCommandBehavior implementation itself. While we are able to use the BehaviorBase<T> implementation as is, we have to do some minor changes to the EventToCommandBehavior to enable a few more usage scenarios. The first change we need to make is to derive Xamarin’s EventToCommandBehavior sample from VisualElement instead of View. This way, we can also use the behavior on controls that do not derive from View, especially in Pages. Pages do not derive from View, but they do from VisualElement (like Viewdoes, too). You need to change the Type also on the parameter of the OnAttachedTo and OnDetachingFrom methods in this case (which are the other two changes we need to do). The rest of the implementation is basically the same like in the Xamarin sample and works quite well. To show you a simple sample in Action, we are using the Appearing and Disappearing events to attach them via the behavior into our ModalPageViewModelon the ModalPage we integrated before. This way, you won’t need the IViewEventBrokerService I showed you in my post on navigation and modal pages. It is up to you to choose the way you want to go along, both ways are fully respecting the MVVM pattern. I am attaching the behaviors only if the BindingContextdoes derive from my XfNavViewModelBase. The Command can be set directly in this case, without the need to use the SetBinding method. The above overrides are using the IDialogService you will find in the sample application to show a simple message from which overriden Execute...Command method they are created from. Xamarin.Forms has only a few events that have usefull EventArgs. At the time of writing this post, I tried to find valid scenarios where we want to get some things of the events to attach also an IValueConverterimplementation to get this data out of them. Fact is, the only one I ever used is the one from the Xamarin sample – which is a converter that gets the selected Item for a ListView. Because Xamarin.Forms Views already provide most of the properties I ever needed, I was able to solve everything else via Binding. To make this post complete, you can have a look into Xamarin’s sample implementation here. Hooking into events on the view side of our applications can be done in several ways. It is up to you to choose the route you want to go. With this post, I showed you a second way to achieve this. If you have some more valid scenarios for using the EventToCommandBehaviorwith a Converter that cannot be solved via Binding directly, I would love to hear them. Feel free to leave a comment here or via social networks. Of course, I updated the sample on Github with the code from this post. As always, I hope this post is helpful for some of you. Until the next post, happy coding! In this post, I will show you how to display dialog messages (also known as message box). 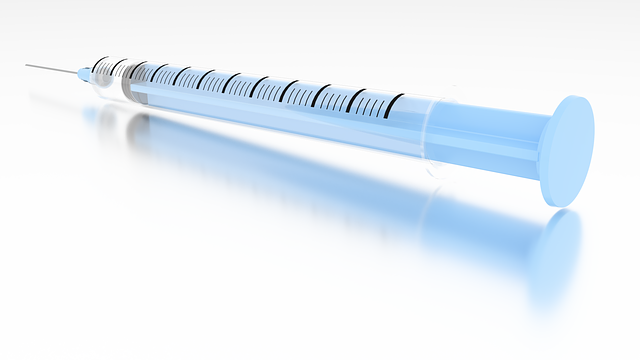 This time, we will use again native implementations (like in the second post about Dependency Injection) to get the job done. I could have used the Xamarin.Forms Page.DisplayAlertmethod, but that one does not allow a lot of customization, so I went down to implement it my way. In the first three lines I am setting up a new AlertDialog , taking into account the actual Xamarin.Forms.Context, setting the title and the message content. If no other option is used, this shows just with the standard “OK”-Button to close the message. Often we want to modify the button text, that’s where the confirmButtonText and cancelButtonTextoverloads are being used. I am also using a callback method that takes a Boolean to show which button on the message was pressed. Showing the Dialog needs to be done on the main UI Thread. Xamarin Forms provides the Device.BeginInvokeOnMainThread method to dispatch the code within the action into the right place. I am showing the dialog while keeping a reference in the _openDialogs List. This reference is removed once the matching button or cancel action is executed. If the message is allowed to be dismissed via outside touches or other cancel methods, this happens in the CancelEvent Eventhandler delegate I am attaching. The implementation also has a way to close all open dialogs, but it is a good practice to have only one open at a time, especially as other platforms do support only one open dialog at a time. Microsoft recommends to use the ContentDialog class to show messages and dialogs of all kind. So this is what we will use to show our dialog messages. Like on Android, we need a Task.Run()wrapper to make the implementation async. The setup of the dialog is kind of similar to android. First, we are creating a new dialog setting the title and the message. The second part is a bit more complex here. Dialogs should hook into the CloseButton properties and events in all cases, at least after OS-Version 1703 (Creators Update). This way, the CloseButtonClickevent is also raised when the user presses the ESC-Button, the system back button, the close button of the dialog as well as the B-Button on the Xbox-Controller. When we have only one button to show, our confirmButtonText is directed to the CloseButton, otherwise to the PrimaryButton. In the second case, the CloseButtonis connected with the cancelButtonText. We are using the same callback Action as on Android, where the bool parameter indicates which button was pressed. In the UWP implementation the additional parameters cancelableOnTouchOutsideand cancelableare not used. The base implementation on iOS is basically the same like on Android and UWP. In case of iOS, we are using the UIAlertController class, which is mandatory since iOS 8. What I am doing here is straight forward – I am setting up a new UIAlertController instance via its creation method, telling it to be styled as an alert. Then I need to create two UIAlertAction instances, one for the confirmButtonText and one for the cancelButtonText. Of course, I am hooking up the prior defined callback action, which will inform the Xamarin.Forms class about the result of the dialog. To display the Alert, we need a reference to the RootViewController of the iOS application. In most Xamarin.Forms applications, the above code will do the job to present the UIAlertController via the PresentViewController method provided by the OS. Like the UWP implementation, also the iOS implementation needs to be executed in the main UI thread, because the UIKit demands it. That’s why also here, the whole code is running inside the Device.BeginInvokeOnMainThread method’s action delegate. The additional parameters cancelableOnTouchOutsideand cancelableare not used on iOS. And that’s already all we need to do here. Really. This shows a simple message without using the additional parameters. I use this one primarily for confirmations. This one takes an exception and shows it on the screen. I use them mainly for developing purposes. This one provides a choice between two options. A good example where I use this is when there is no internet connection and I ask the user to open the WiFi settings or cancel. In the sample, I am also showing another simple message after one of the buttons has been pressed. The content of this simple message depends on which button was clicked. 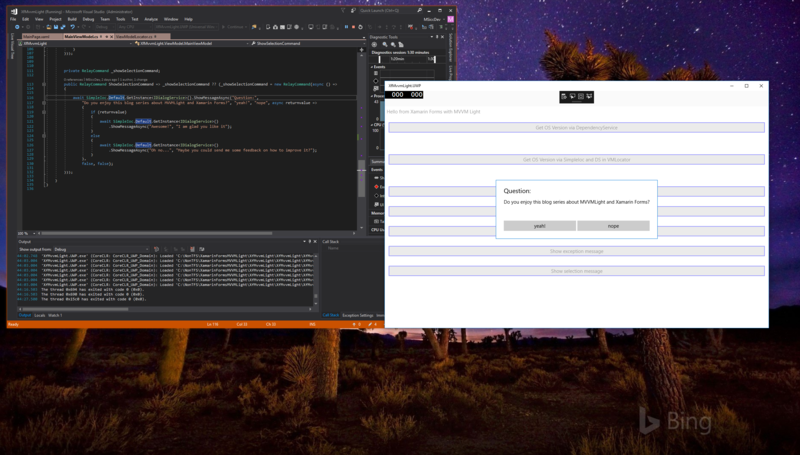 Using Xamarin.Forms’ DependencyServicetogether with the SimpleIoc implementation of MVVMLight, we are once again easily able to connect platform specific code to our Xamarin.Forms project. Every platform implementation follows the dialog recommendations and is executed using the native implementations while keeping some options open to use different kind of message dialogs. After showing you the basic MVVMLight Setup I am using as well as how to combine Xamarin.Forms’ DependencyService with our own Dependecy Injection-mechanism, this article is all about Navigation and modal pages in Xamarin.Forms. I always liked how the MVVMLight Toolkit provided the NavigationService for my Windows & Windows Phone applications. That said, I tried to keep the idea of its NavigationService and ported it over to my Xamarin.Forms structure. I also extended it to fit the needs of my XF apps, for example for pushing modal pages (we’ll see that later). So for the base idea, I have to say thanks to Laurent Bugnion for the Windows platform implementation in MVVMLight and for keeping it simple. The later fact allows one to easily extend and adapt the service. Also, there are tons of really good and also working samples around the web to show navigation in Xamarin.Forms. However, most of them follow another strategy, so I came to the point where decided to write my own implementation. My way may work for most scenarios without making a difference between navigation and showing modal pages. It provides an easy implementation and usage while following the MVVM pattern as far as it can go with Xamarin.Forms. As you can see, it is a pretty big interface that covers nearly all possible navigation scenarios of a Xamarin.Forms app (at least those that I had to deal with already). We are going to hook into a Xamarin.Forms NavigationPage and configure our page handling cache with the configure method. As all navigation methods in Xamarin Forms are async, all navigational tasks will be implemented async as well. Additionally, we will have some helpful properties that we can use in our application implementation. Now that we have our interfaces defined, we are going the next step and have a look into their implementations. First it is important to understand what Xamarin.Forms does when we are using a NavigationPage. We are performing a hierarchical navigation here. A must read is this page from the Xamarin documentation. We could also use a constructor injection here. Most of the time it would work, but I had some problems to get the timing right under certain circumstances. That’s why I prefer to manually initialize it to overcome these timing problems – and it does not really hurt in real life applications to have it a bit more under control. Before we are going to see the actual implementation, I need to break out of this scope and explain a threading issue. Often we are running a lot of code at the same time. This could bring up some issues with ourXfNavigationService. If multiple threads try to change or execute code from our interface implementation, the result may not the one we desired. To prevent this, we would normally use the lock statement to allow only one thread modifying our code. Problem with the lock statement is, that we cannot run asynchronous code within. This will only allow one thread to access the objects we are passing after it, and before releasing it (which is our responsibility). The code itself is recommended to run in a try..finally block (you’ll see that below). Pretty much the same thing the lock statement would do, but with the possibility to run asynchronous code. [Update:] Until the latest Xamarin.Forms release, there was no need to use the Device.BeginInvokeOnMainThreadmethod for the navigation itself. I only checked it recently that the Navigation needs now the call to it to dispatch the navigation to the main UI thread. Otherwise, the navigation will end in a dead thread on Android and iOS (but strangely not for UWP). I updated the code above and the source on Github as well. The last things that I wanted to note are properties that return the current counts of both the modal and the navigation stack of the navigation page as well as the GoHomeAsync() method to return to the root page. You will see these in the source code on Github. We have two events that can be raised with their corresponding Raise… methods. That’s all we have to do in here. //todo, but not needed atm. Let me explain what this base class does. It provides a BindableProperty(which is the Xamarin.Forms version of a DependencyProperty) that takes the registered key to provide it as a parameter. You can bind the key from your ViewModel or set it in code behind/XAML directly, all these ways will work. The base page implements our interfaces of the IXfNavigationService and the IViewBrokerServiceinterfaces as members and loads them in its constructor. The _stackStatemember is just an easy way to provide the needed data to the event-raising methods of our IViewEventBrokerservice. If used correctly, every page that derives from this base class will throw the corresponding events, which can be used in other parts of our application then. The XfNavViewModelBase implements both the IXfNavigationService and the IViewEventBrokerService interfaces. It also registers for the events thrown by IViewEventBrokerService. Making them virtual allows us to override them in derived ViewModels, if we need to. It has a string property to set the name of the View we want to use it in as well as a method that checks automatically if we are on a modal page if it gets called. Now our navigation setup is ready it is time to have a look into how to use it. First we are going to create two pages, one for being shown modal, and one for being navigated to. I am always using the nameof()-operator for this, because it makes life a bit easier. The second step is the missing piece in the service registration, the GetPageInstances() method that returns an instance of the IXfNavigationService interface implentation and registers our two pages via the Configure() method. The sample project has a modal page and a navigated page to demonstrate both ways. No we have a fully working and MVVM compliant navigation solution in Xamarin.Forms using the MVVMLight Toolkit. I know there are several other toolkits and helpers floating around, but I like it to have less dependencies. Another advantage of going this route: I am mostly familiar with the setup as I am already used to it from my Windows and Windows Phone applications. Creating this setup for navigation does not take a whole lot of time (the initial setup took me around 3 hours including conception). One can also pack the interfaces and the implementations in a (portable) class library to have all this work only once. If you have feedback for me, feel free to leave a comment below. Like always, I hope this article is helpful for some of you. The updated sample application can be found here on my Github account. This interface gets the current installed version of the operating system. The next step ist to create the platform implementation, which is commonly defined as a service class. Tip: I am using a separate folder for platform implementations and set it to be a namespace provider. This makes it easier to maintain and I keep the same structure in all platform projects. Now that we have our platform implementations in place, we can go ahead and use the interface to get the OS versions. In my sample application, I am using a button that fetches the OS version via Xamarin Forms DependencyService and display it into a label in my view. Only with that extra line of code, it will actually work like it should. If you want to know more on the fact that UWP needs a separate solution, take a look here into the Xamarin docs. Why use the MVVMLight Toolkit’s Ioc? You see, there are some (in my opinion) good reasons to use the built in Ioc of the MVVMLight Toolkit. If you do not want (or it is not possible due to complexity) register the platform implementation directly in the ViewModelLocator, you can go down another route. You could create a new interface in the Xamarin Forms PCL which references the interface with the platform implentation as a member. Your implementation of this new interface (in Xamarin Forms) will be responsible for the getting the instance of the platform implementation via the built in DepenencyService. I already used both ways in my recent Xamarin projects, but I prefer the first way that I described above. Due to the fact that we know the DI pattern already as we (of course) follow the MVVM pattern in our applications, there is no big mystery about using the built in DependencyService of Xamarin Forms. We can easily integrate it into the MVVMLight Toolkit and combine the best of both worlds this way. Nonetheless, I know that also some beginners are following my posts, so I tried to describe everything a bit more extended. As always, I hope this post is helpful for some of you. In my next post, I will show you how I solved the Navigation “problem” in my Xamarin Forms applications. In the meantime, you can already have a look at the sample code on Github. Updated some code parts that needed to be changed in the ViewModelLocator. Like some of you may have already registered, I have been doing the next step and went cross platform with my personal projects. I am primarily using Xamarin Forms, because I eventually like XAML a little too much. I took a break from round about 2 years on my Xamarin usage, and I am happy to see that it has improved a lot in the meantime. While Xamarin Forms still has room for improvementes, one can do already real and serious projects with it. As I like the lightweight MVVMLight toolkit as much as I like XAML, it was a no-brainer for me to start also my recent Xamarin projects with it. There is quite some setup stuff to do if you want get everything working from the Xamarin Forms PCL, and this post will be the first in a series to explain the way I am currently using. Some of the things I do may be against good practice for Xamarin Forms, but sometimes one has to break out of them to write code more efficiently and also maintain it easier. Before we are going to write some code, we will update and add the additional packages from within the NuGet Package Manager. If your are not targeting the Android versions 7.x , Xamarin Forms is not able to use the latest Android Support libraries, so you’ll have to stick with version 23.3.0 of them (see release notes of Xamarin Forms). Since it makes sense for a new app to target the newest Android version, we’ll be updating the Android Support packages for our sample app as well. If the NuGet Package manager demands you to restart, you’ll better follow its advise. To verify everything is ok with the updated NuGet packages, set the Android project as Startup project and let Visual Studio compile it. 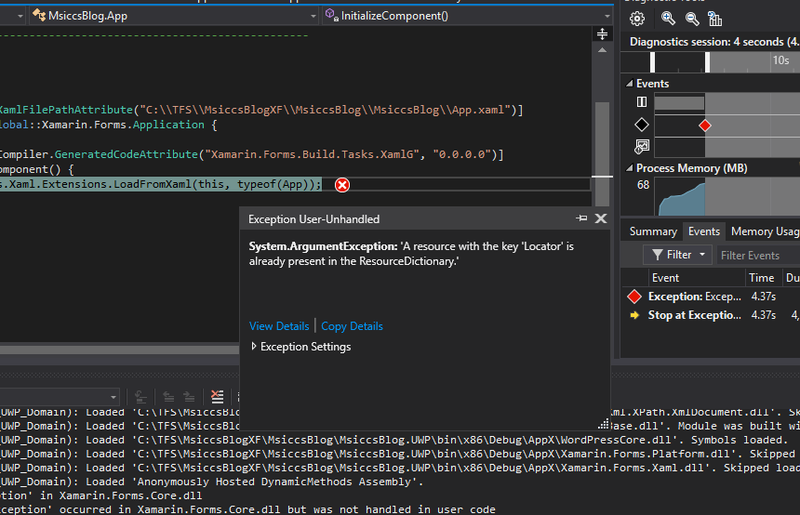 If all goes well, let’s make sure we are using the right UWP compiler version for Visual Studio 2015. The .NETCORE package for the UWP needs to be of Version 5.2.x, as 5.3 is only compatible with Visual Studio 2017. Now that we have set up the baisc MVVM structure, we are going to connect our MainViewModel to our MainPage. There are two ways to do so. If you get the same screens, you are all set up to use Xamarin Forms with MVVMLight. I know there are several specialized MVVM frameworks/toolkits floating around, which are commonly used for Xamarin Forms. As I am quite used to the MVVMLight toolkit, I prefer it over them. It is a lightweight solution, and I have more control over the code that is running than with the other options. I know I have to handle a lot of things in this case on my own (Navigation for example), but these will get their own blog posts. Starting with one of the future posts in this series, I will provide a sample app on my Github account. If you have feedback or questions, feel free to get in contact with me via comments or on my social accounts. Otherwise, I hope this post and the following ones are helpful for some of you. As I have finished my first iOS app with Xamarin.Forms, I want to share my experience that I made during writing it. It sounds great. Build the code once, run it on Android, iOS and Windows Phone (8). Xamarin is using the well known PCL to achieve this goal, or a shared asset project. As I am familiar with the PCL structure, I decided to go with this one. The application I wrote for Telefónica had already their Windows Phone and Android counterpart. My thought was to bring together all three after finishing the iOS app into the Xamarin.Forms project to make it easier to maintain them (that was before it was clear that I would leave, but that’s another story). In the end, I focused on the iOS platform and implementation, leaving the other two out. It was far easier to start a new iOS app with Xamarin.Forms than in the traditional way. 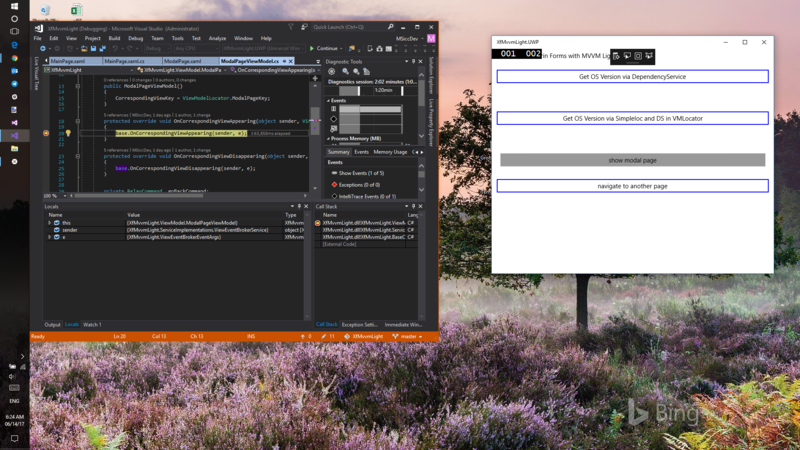 Although there are some XAML gotchas (like Nicolò wrote already on his blog), it is pretty easy to get started with it. The number one tip I can give you is to wrap everything in a principal Grid and set you ColumnWidth (also if you have only one single Column). This will help you to better position your controls on the page. One really annoying thing is the missing IntelliSense support when you’re writing your XAML code. What does that mean? It means your will spend a lot of time with trial and error as well as reading the documentation in the beginning. One thing that is solved in a good way is the access to native functions that are not implemented in the Forms project. Connecting through interfaces and Xamarin’s DependencyService, you can write the implementation you need in the native project and call the function from the Forms PCL. I will cover this in another blog post. Often, you want/need your app to be designed in a different way (like I had to for Telefónica). 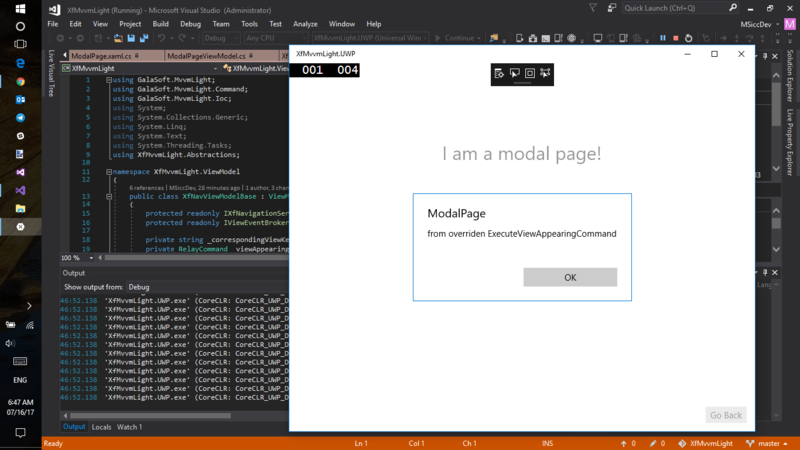 Some basic modifications are possible from the XAML part. But the most effective way to achieve this goal for the whole app is to use Custom Renderer. This will be another post’s topic in the coming days. Overall, Xamarin.Forms is already impressive. But you need to know that you will work with some workarounds when you start. If you are willing to do this, you might be able write a cross platform app in little time. If you do not want to dig into the documentation or use the techniques I wrote about, Xamarin.Forms might not yet be your starting point for your cross platform app. One last tip: To make it easier for you, there is the Xamarin.Forms Lab project. This community project has already extended Xamarin.Forms, and is worth a look and a second thought if you truly want to do a cross platform app with Xamarin.